Although inclement weather precluded journalists from trekking out to Phillips Station – near Sierra-at-Tahoe — with representatives of the state’s Department of Water Resources (DWR) for the fourth snow survey of Water Year (WY) 2018/2019, the manual survey’s results were phenomenal. Braving the winter elements DWR representatives recorded 106.5 inches of snow depth and a snow water equivalent (SWE) of 51 inches. This represents 200 percent of average for this location. Nemeth’s “all-of-the-above approach” is in reference to the state’s fickle water supply ranging from extreme drought conditions one year and a plethora of atmospheric rain and snow the next year forcing Californian’s to truly save water not for a rainy day but rather saving water for the inevitable next California drought. The “all-of-the-above approach” means continual conservation, managing the precipitation we do get and looking for new sources of water. For now, the state’s largest six reservoirs currently hold between 106 percent (Oroville) and 132 percent (New Melones) of their historical averages for this date. Lake Shasta, California’s largest surface reservoir, is 109 percent of its historical average and sits at 89 percent of capacity. In February alone California experienced six atmospheric rivers; more than 30 of these powerful storms have deluged the state since the start of the water year. DWR representatives are reporting that statewide the snow water equivalent has nearly tripled since February 1. 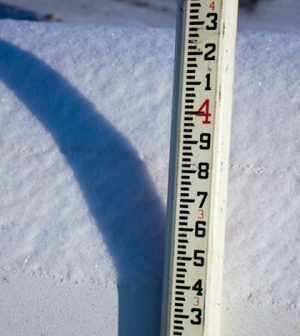 Snow water equivalent is the depth of water that theoretically would occur if the entire snowpack melted instantaneously. It is a tool used by water managers across the state to estimate anticipated spring runoff. The Sierra snowpack supplies about 30 percent of California’s water needs each year as it melts into streams and reservoirs in the spring and early summer to meet water demands throughout the year. The April results are a key indicator for the rest of the year’s water supply. DWR conducts up to five snow surveys each winter on or near the first of January through April. If necessary, a fifth snow survey is done in May – at Phillips Station though the snowpack’s water content typically peaks around April 1. After that point in time the sun’s higher position in the sky frequently begins to accelerate the snow melt. The manual snow survey measurements done four or five times each year augment electronic readings from about 100 snow pillows in the Sierra Nevada. Together these measurements provide a current snapshot of the water content in the snowpack. Although the abundant Sierra Nevada snowpack is welcome news in contrast to last WY’s drought conditions, the melting snow could spell flooding in the coming weeks depending on how rapidly the snow melts. Jon Ericson, DWR chief of the Division of Flood Management cautions people to remains alert when in or around moving water.